Here is a great stunt pulled by a group called Improv Everywhere. 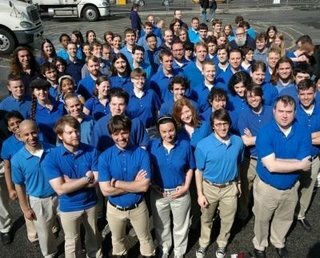 They rounded up 80 people and dressed up in the Best Buy employee uniform of royal blue shirts, khaki pants and a belt and infiltrated a Best Buy. With 80 new Best Buy employees standing around, customers had plenty of people to ask for directions and help, which they were happy to give. When real employees asked them why they were there, they would say they were waiting for their girlfriend/boyfriend. They snuck in video cameras as well to film the fiasco, it's pretty funny.